Construction under way on site. CG Hotels and Resorts, the hospitality division of Nepalese billionaire Binod Chaudhary, has kick-started the construction of its latest hotel in Dubai, UAE. Called Taj Vivanta, the five-star hotel is being built at Jumeirah Lake Towers (JLT) and will be managed by the widely renowned brand Taj. 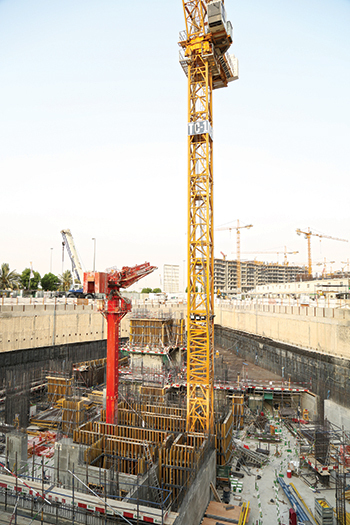 The piling work has been completed and the main contractor Al Shafar General Contracting has commenced structural work on the project. 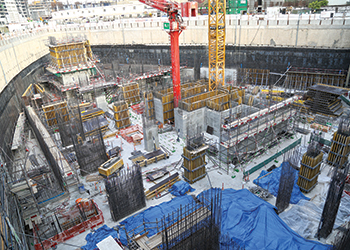 Currently, waterproofing works for the basements are under way along with the structural work. CG Hotels and Resorts is undertaking the project on behalf of the client Signature Zinc Holdings, while Arch Group is the consultant. The 200-key Dubai hotel is one of two projects being initiated by CG Hotels and Resorts as part of its strategic expansion across the Middle East and Africa, having identified key markets in the region. The first of the two hotels is to open imminently in Rwanda. He says this is a part of the company’s larger global development strategy, with a target to more than double the number of hotels to 200 by 2020, which would make CG Hotels and Resorts a dominant player in the hospitality sector globally. 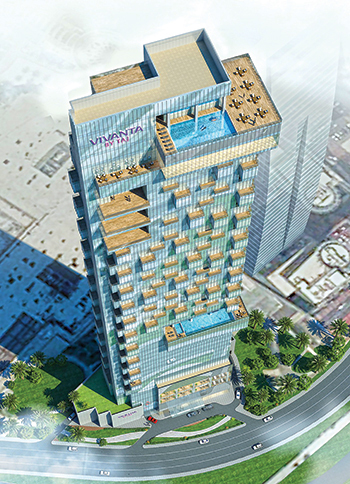 Taj Vivanta is prominently located opposite Dubai Marina in Jumeirah Lake Towers. It will comprise both a hotel and residential units and will rise up to 46 floors. “The first four floors are public areas followed by 11 floors of guest rooms and suites. The remaining floors are residential units. There are four floors of underground car-parking at the walkway of JLT. In addition, the top two floors of the building serve as F&B (food and beverage) areas for the hotel,” a project spokesman tells Gulf Construction. “We aim to make this hotel one of the most recognised and preferred destinations for business travellers,” he continues. Taj Vivanta will have a full glass façade with various openings, giving the building a three-dimensional effect. The entire project is expected to be completed by Q4 2018. “The façade of the building is completely made of curtain-glass, which along with the proposed lavish interiors easily make Taj Vivanta one of the best looking and functional buildings in JLT by far,” the spokesman adds. What sets it apart from other buildings, according to the spokesman, is that it is only the second high-rise in Jumeirah Lake Towers to have a podium of its own. As such, guests will not have to share parking with any other residents within JLT. The Taj Vivanta ... an artist’s impression. CG Hotels and Resorts is part of the CG Corp Global conglomerate. Comprising 79 hotels with 4,411 keys in 59 destinations across 12 countries including its own Zinc & Fern branded hotels and resorts, CG Hotels and Resorts has a proud history of successful joint ventures with esteemed partners and brands such as Taj, Alila, Jetwing and The Farm, amongst others. Its diverse portfolio of owned and partner hotels under these brands include acclaimed properties such as the iconic Taj Exotica Resort and Spa Maldives, Taj Samudra Colombo, The Farm in Philippines, Jetwing Vil Uyana in Sigiriya Sri Lanka and Taj Safari lodges in central India. CG Hotels and Resorts also has strategic investments in multiple management companies, which owns several brands in the luxury, business, wellness and budget space across various geographies such as Alila, and Zinc and Fern. Under its management company arm, Concept Hospitality and Alila, the group manages over 40 hotels with another 35 projects in the pipeline in India. CG Corp Global is a transnational conglomerate with a legacy of 150 years. Present in over 30 countries and five continents with 76 brands, 80 companies and an employee base of 10,000 people, it is Nepal’s first and only Nepalese billion-dollar conglomerate to be featured in the Forbes list of billionaires since 2013.